Should you outsource your 3D printing projects or integrate 3D printing technology in-house? With 3D printing transforming the way products are designed, prototyped and produced, companies are increasingly integrating the technology into their manufacturing processes. However, in doing so, many companies face the challenge of whether to use 3D printing in-house or outsourcing to a specialist 3D printing service bureau. Admittedly, there is no one-size-fits-all approach: both options have their pros and cons, and the choice ultimately depends on the goals of your organisation. However, to help you in your decision-making process, today’s guide will take a closer look at the pros and cons of both options and explore the key factors every company should consider when implementing their AM strategy. One of the most important factors to consider is your application of the technology and, consequently, the complexity and function of your part. For example, if you plan to produce scaled models or functional prototypes which will require multiple design iterations, it may be more cost-effective to opt for an in-house AM system, of which there are many desktop systems on the market. 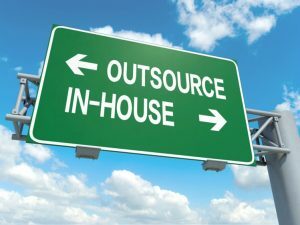 Conversely, outsourcing may prove to be a more sensible approach for complex end parts. With expert teams and engineers, service bureaus, such as Paragon Rapid Technologies, are well-versed in design for additive manufacturing requirements, for example. They can also offer a larger range of machines with bigger printing capacities. How frequently you will be producing parts and your production volume are another key factor. If your team or department will be using additive manufacturing for low-run or one-off projects, this may not warrant investment into an AM system. However, if your strategy is to use additive manufacturing for multiple projects and produce a constant stream of parts and prototypes, investing in your own AM system could prove more cost-efficient in the long-term. While there are many budget-friendly desktop systems on the market, manufacturing parts in-house will often require a significant upfront investment. This not only includes the cost of your AM system, but also the cost of training employees, materials procurement and ongoing maintenance costs (the list could go on). Here, careful evaluation is key: if these expenses are not justified by the production volume and frequency of your projects, you may want to work with a service provider. How knowledgeable are your employees about the design and production considerations for AM? Since additive manufacturing differs significantly from traditional manufacturing methods, companies seeking to implement 3D printing must ensure that design and production guidelines for the technology are well understood internally, with skilled operators on hand to lend guidance. If your knowledge of the various AM technologies and design considerations is limited and you do not have the time or resources to develop the relevant expertise internally, outsourcing may be a better way to familiarise yourself with the technology and eliminate risks arising from a lack of experience. On-demand production: If you require quick turnaround times and fast iterations, having your own additive manufacturing system is typically worth the investment. Once your system and training are in place, project deadlines can be met more easily with “on-demand production”, and designs can be tweaked as often as is necessary without the shipping costs associated with outsourcing. When insourcing, more time can also be saved by printing overnight or over the weekend. Lower cost: 3D printing in-house can prove to be more cost-effective than outsourcing, as associated costs, such as shipping and delivery are eliminated. The cost of industrial AM systems can easily run into the tens and hundreds of thousands. This means that integrating 3D printing technology into your organisation will often require a significant upfront investment (although less expensive, entry-level industrial and desktop 3D printers are also an option for smaller companies). For this reason, investing in an industrial system should be part of a longer-term AM strategy to ensure that any initial costs are mitigated by long-term savings in production and outsourcing costs. This should include factoring a budget for maintenance as well as additional systems (e.g. cleaning, finishing stations and HVAC) and procuring materials. Since additive manufacturing differs significantly from traditional manufacturing methods, 3D printing in-house will require hiring or training operators to run the system. 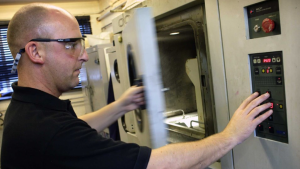 No upfront investment: Outsourcing your AM production means that you may not need to invest in costly AM systems, since service bureaus will offer a range of machines and technologies. Additionally, you’ll also be able to save on the costs of ongoing maintenance. 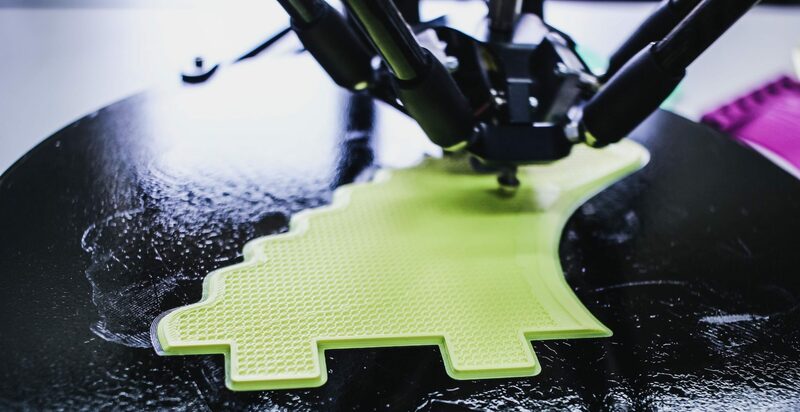 Wide choice of technologies: As service bureaus will typically own several technologies, outsourcing provides companies with a wider selection of 3D printing technologies and materials. This means your organisation can try out different options without having to invest in multiple systems. 3D printing expertise: Service bureaus will inevitably have a high level of expertise and be able to advise you on the most suitable materials, design considerations and so on. Additionally, many bureaus offer design and finishing services, both of which require significant data preparation and post-processing. The cost of an externally 3D printed part is higher than the cost of a part produced in-house. Furthermore, outsourcing can be slower than internal 3D printing due to various delays and delivery time. When choosing between in-house 3D printing and outsourcing, there are a range of factors to consider — but perhaps the most important is your organisation’s AM strategy. This also means alignment between your company’s stakeholders, including operations and design teams. While we’ve provided some guidelines to the best options for outsourcing or in-house production, it’s important to remember that the choice doesn’t have to be either/or. Combining both approaches could be a particularly efficient way of integrating the technology. For example, companies may have in-house AM systems for producing prototypes and end parts, but turn to service bureaus for finishing work. Also, remember that not all applications will lend themselves to additive manufacturing. 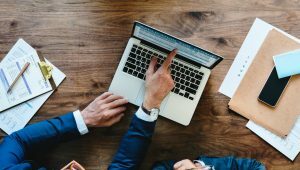 Before introducing AM into your organisation, it is therefore important to ensure there is both a use case and business case for the technology. Ultimately, the needs of your organisation, as well as your AM strategy, must be carefully considered to find the best way of integrating 3D printing into your production workflows.